For big, bold trucks, some truck accessories just don't cut it. It takes a certain amount of attitude and the right build to keep up with larger, lifted pickups. 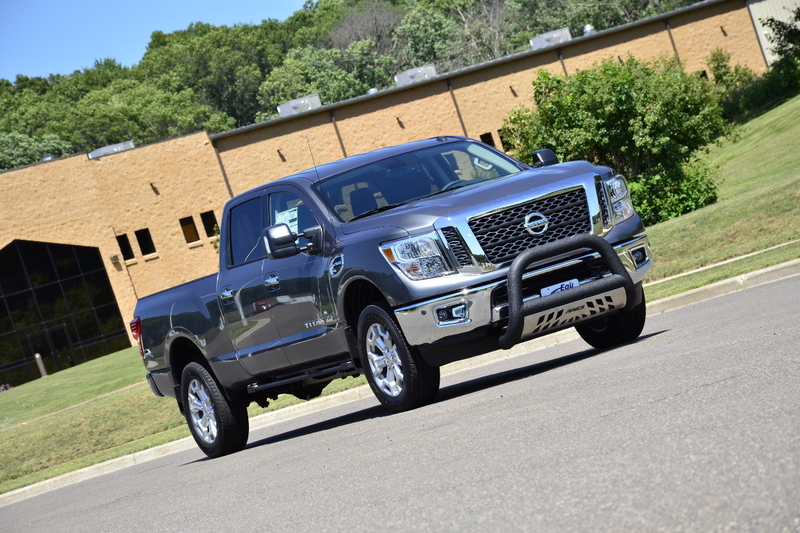 The Big Horn™ truck bull bar was made to live up to the challenge. It features a bold construction, ready customization options, a no-drill installation and two durable finish options. 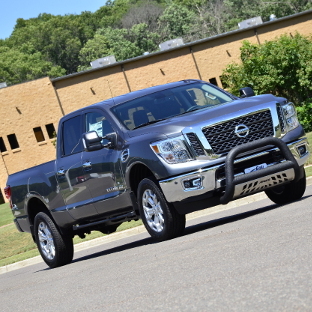 The Big Horn™ bull bar is not just about attitude. 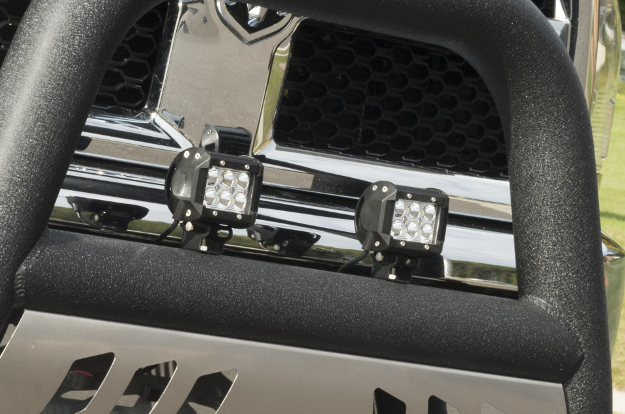 It also offers added functionality on your truck, featuring a pre-drilled crossbar for mounting LED work lights or light bars. 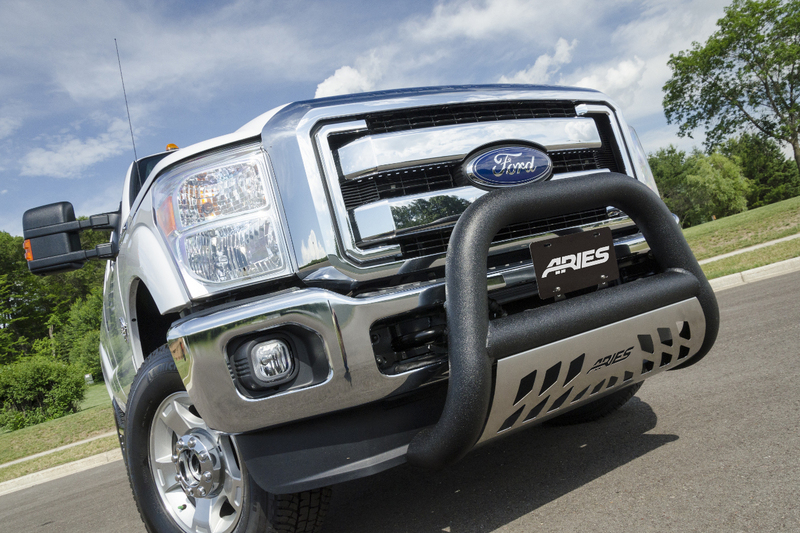 All Big Horn™ truck bull bars are designed for vehicle-specific application and an easy-as-possible installation, requiring no drilling and no tedious custom modifications. From diesel pickup trucks to full-size SUVs, it's all about attitude, and the Big Horn™ is chock-full of it. 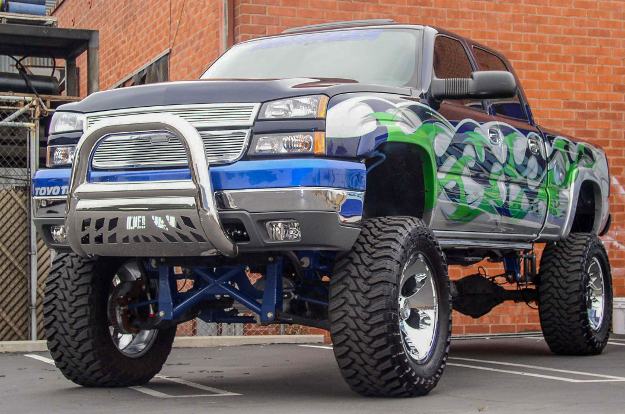 This truck bull bar is built with bold 4" diameter tubing, 1/8" thick walls, a vehicle-specific A-shaped frame and a brushed stainless steel skid plate. The larger tube profile and aggressive cutout of the skid plate are specifically design to accent larger, lifted trucks, giving them that bold, uncompromising attitude. 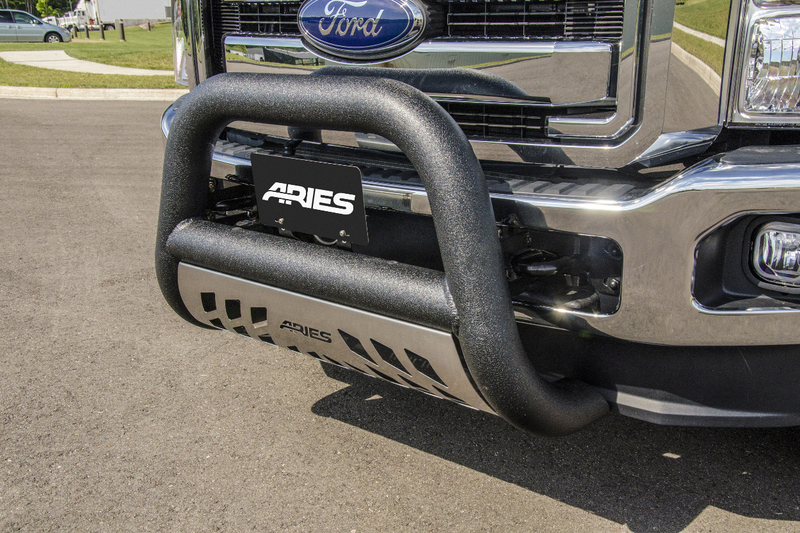 To give the Big Horn™ bull bar the spine to back up its fearless attitude, it is made from an aluminum alloy, making it very lightweight and amply strong. The welded aluminum A-frame construction provides excellent rigidity without the cumbersome weight of steel. 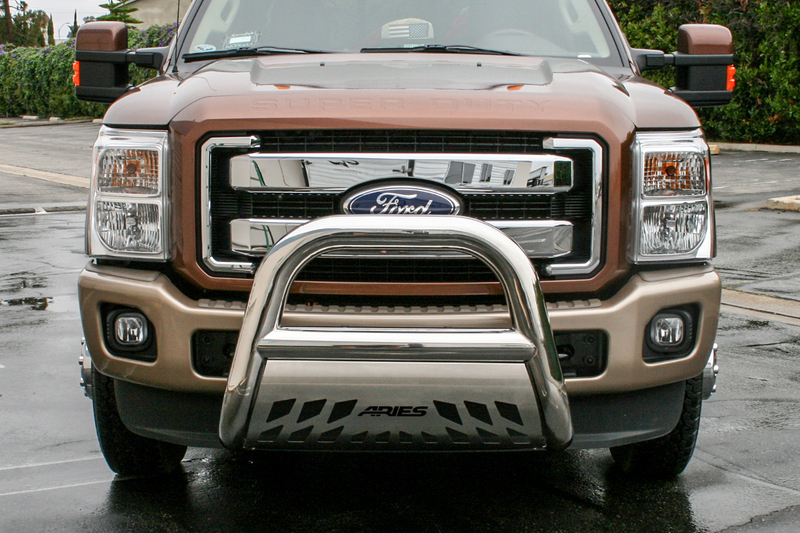 This aluminum bull bar is also highly non-corrosive, making it the perfect addition to an offroad-style truck. It remains rust-free in spite of rain, snow, dirt, mud and other elemental threats. 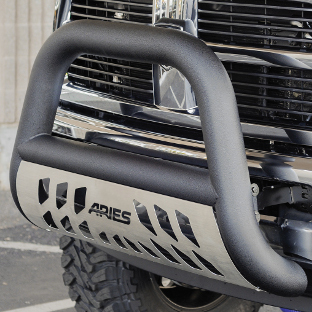 The Big Horn™ aluminum bull bar features a uniquely durable powder coat finish that we call textured black. This hardy, polyester-based powder coat provides maximum corrosion resistance and easily resists scratching, chipping and peeling. 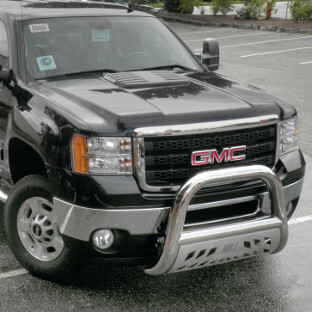 Plus, with its heavily textured surface, this black bull bar has the unique ability to hide grime and minor scratches, making it an even greater contender against the outdoor elements. 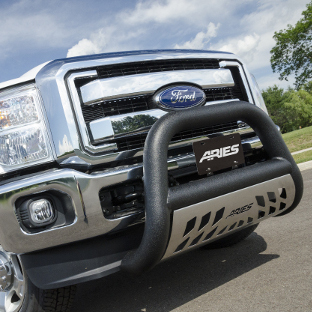 To give you more options for your custom truck build, the Big Horn™ bull bar is also available in stainless steel. 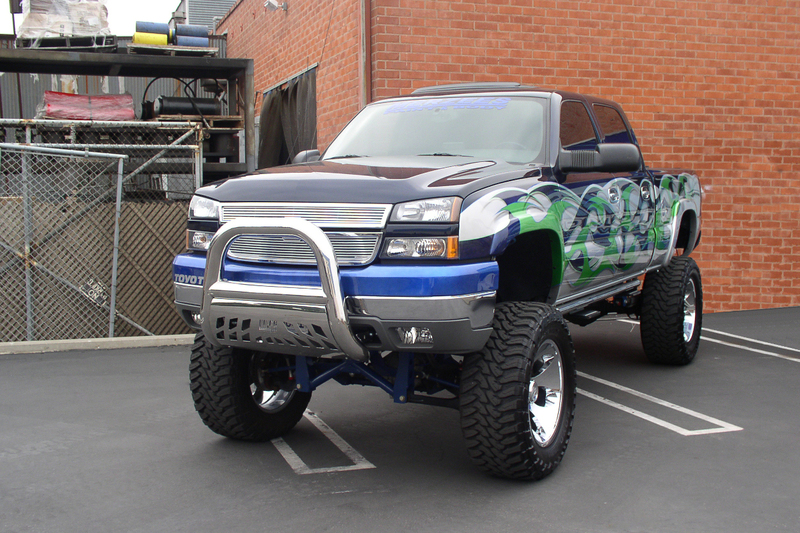 While there are many different types of stainless steel used for truck accessories, ours is a 304 stainless steel. 304 is high in nickel content, making it truly stainless with superior rust resistance. 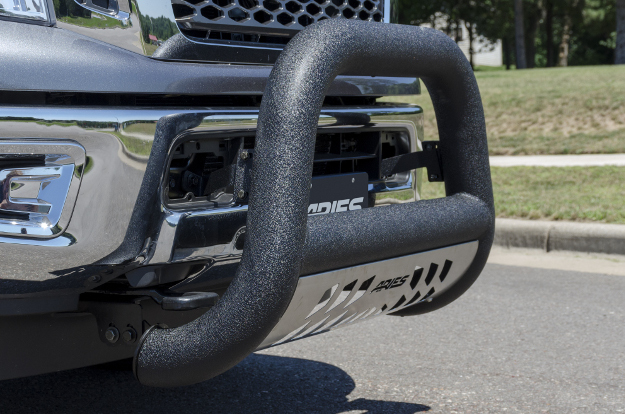 The Big Horn™ stainless steel bull bar easily withstands the wear and tear of the elements, and it features a mirror-like polished finish, adding a bright, clean accent to your truck. 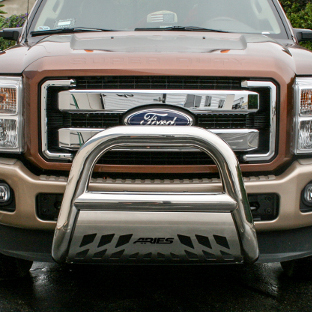 LED light customization is essential to any custom truck build, and the Big Horn™ bull bar is up to the task. It features two pre-drilled holes in the crossbar, allowing for two square LED work lights or one LED light bar to be easily and securely bolted on. LED lights provide bright, useful, eye-catching light on the front end of your truck, whether you're braving the trails or just cruising through town. 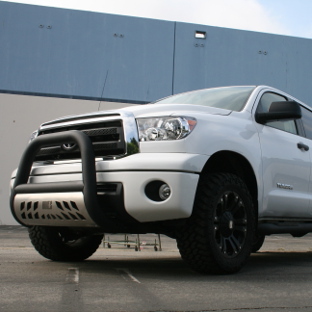 The Big Horn™ can also accept fog lights, offroad lights and any round lights up to 5-1/2" in diameter. 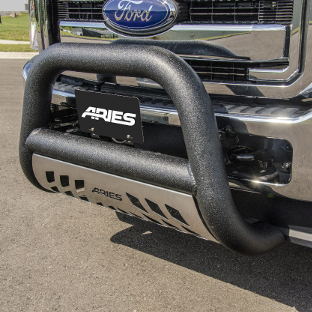 The Big Horn™ 4" bull bar is not only designed to provide a bold, aggressive look, but it is also made to perfectly fit your truck. 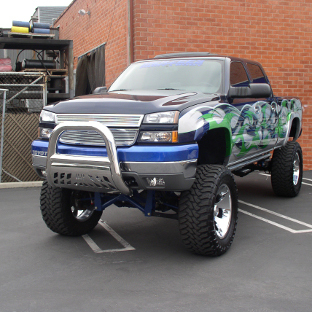 Each has a unique bend to accent the shape of the truck bumper and grille. 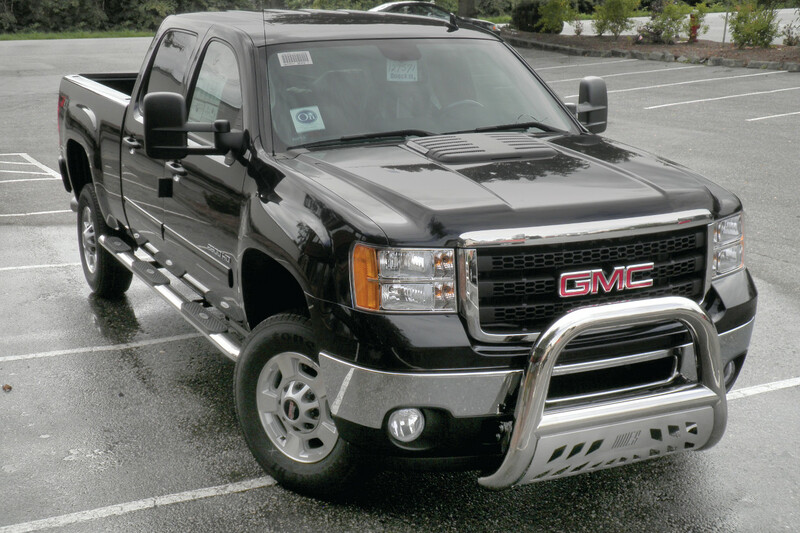 Vehicle-specific brackets are used to mount each bull bar, allowing it to be installed quicker and integrate with the truck like an original equipment accessory. Factory holes in the truck frame are used to attach the brackets, eliminating the need for drilling and costly modifications. 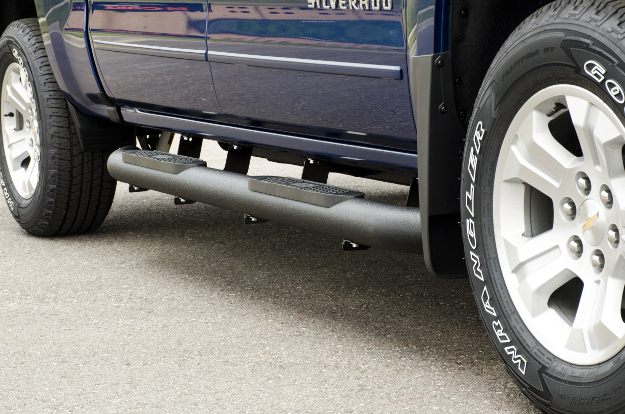 The skid plate of the Big Horn™ truck bull bar provides extra protection on the front end of your truck or SUV, helping to deflect loose gravel, sticks and other small road debris. 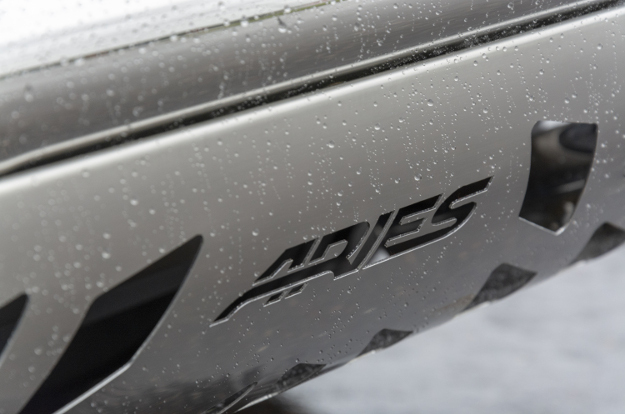 It also features a removable design, allowing you to unbolt it and give the bull bar a sleeker look. The Big Horn™ bull bar skid plate is made from 304 stainless steel for excellent rust resistance, and it has a brushed finish to maintain a clean, consistent appearance in spite of nicks, scratches and scuffs. 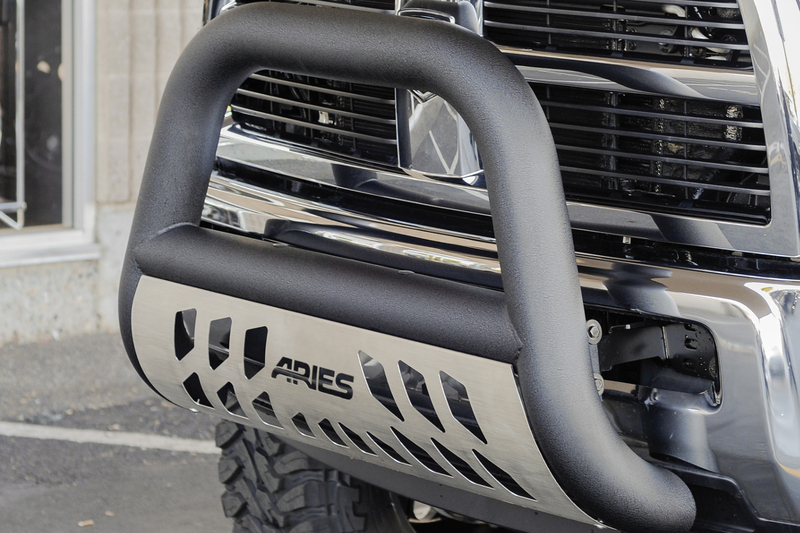 Although the Big Horn™ bull bar can hold its own, it is designed to be accompanied by ARIES Big Step™ side bars. 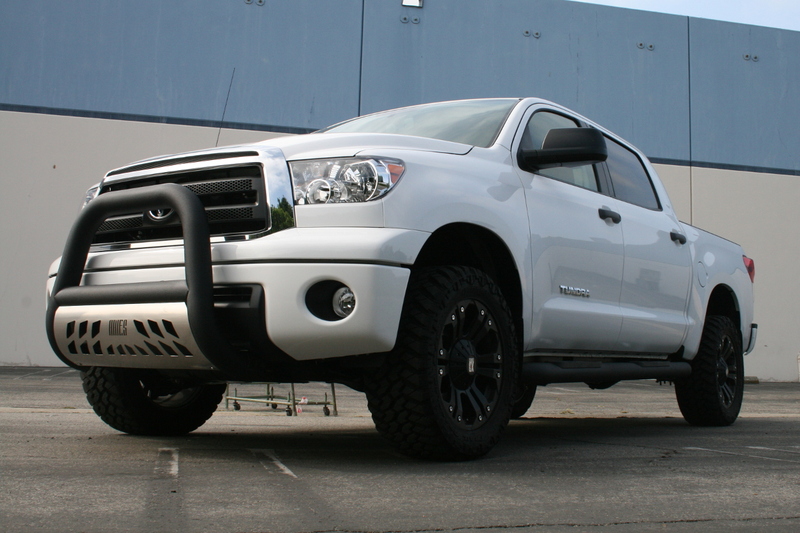 They provide the perfect complement for the bull bar, featuring the same bold 4" diameter to show well on larger, lifted vehicles. Big Steps™ are available in aluminum with our textured black powder coat finish, and they have raised, custom-positioned, non-skid step pads for comfortable, secure footing.